Working as part of the business outreach team I am used to spending lots of time on the road speaking to businesses. With August typically being holiday month and many people and businesses off on their summer breaks, we have taken the opportunity of being more office based to refresh our presentations and online tools. We are currently updating our Health Check tool and you may have noticed that IP Equip has a fresh look. We have also been busy booking our next series of Get it Right First Time seminars. These are half day events aimed at new businesses and first time business owners that we deliver in partnership with Companies House. Together with Companies House the IPO run a series of informative business events. When starting a new business people often assume that by registering as a business with Companies House they are also registering to protect the brand and own the trade mark. Others assume that because they have registered the trade mark, they are automatically entitled to the company name on the Companies House register. It’s important to check both. A big misconception is that “IP is only for big businesses, it won’t affect me”. Every business, no matter how small, will own IP. It may just be the name that you have chosen to trade under. Don’t get it wrong, make sure that the name you have chosen is free to use. Check both the Companies House Register and the trade mark register. You do not want to infringe another business, even unintentionally. When talking to businesses we also often hear “IP is expensive” but some IP rights are free and automatic. Without filing any forms or paying any fees you may will have some type of IP within your business. Such as copyright, design rights or an unregistered trade mark. You can register your IP from as little as £60 when registering a design and a trade mark can be filed online from £170. We have also introduced the trade mark “Right Start” service. So if you are not sure whether you trade mark meets the criteria, you can pay only half the fees upfront to receive the examination report, before deciding if you want to proceed with your application. These are just a sample of the kinds of things we cover at our Get it Right First Time events. Our seminars give businesses the opportunity to gain an understanding of IP and find out what their responsibilities are as a company director. We try to dispel some myths and give the information in plain language, so that businesses can see how IP may benefit them. 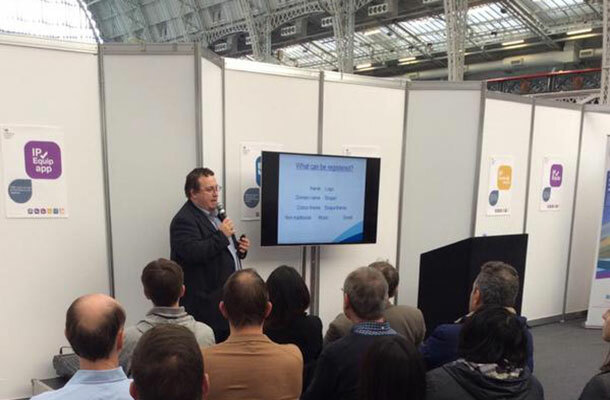 My colleague Andrew talking IP at Olympia London. We look forward to seeing you soon. Keep an eye on our events calendar to see when we are at an event near you. You may find that you have more IP than you thought. Its certain very important to check the Trade Marks register and also the Companies House register before choosing a company/ trading name. I would also suggest that in addition you also check the Domain Name register to see if the domain name is also available. In certain circumstances a domain name owner can assert rights in unregistered trade marks such as domain names, including a claim in the tort of passing off.